Welcome to our website, here we have several different standards options for various types of work, take a look at our standards later and increase your knowledge and practices always. I really like what crochet gives us besides the people who make extra money by selling crocheted work. I love what we can do with the flowing creativity and also the satisfaction with the finished work. is a multitude of things we can do with this tool. Something done by our own hands and leaves beautiful works. I like to make collections of the types of yarns that exist, both the smooth and the mixed colors that I find beautiful. I love everything that is about crochet and I always update in the new innovations and patterns that are always coming up and of course we have to learn the classics that have been around a long time. One of these is the pattern that I brought to you today, it's a classic in the crochet world, whenever someone starts to practice have to do this patten that has an incredible result. 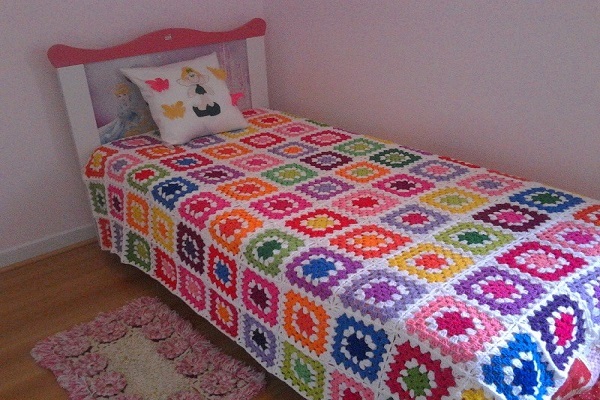 Beginners in crochet will love this crochet blanket pattern that is a simple and fun crochet pattern to do. So you can make a quilt right at the beginning of your crochet experience. This pattern of square has been around for a long time and is practiced all over the world by this Afghan, since it is known and made from the time of the ancient ova. This pattern looks beautiful on the bed and putting mixed colors gives the room more joy and combies much the color with child's room. RND 1:Ch 4, join with sl st to first ch to form ring. Ch3, 2 dc in rg. Ch 2, *3dc in rg, ch3. Repeat from * 2 times more. Ch2, slst in top of ch3. RND 2: Sl st in the first 2 dc's and in the first ch 2 lp. Ch3, 2 dc in ch 2 sp, ch2, work 3 dc in same sp. Work the following 3 times (Ch1, work 3 dc, ch2, 3 dc in next ch 2 lp.) Ch1, join with slst to top of ch 3. RND 3: Sl st in the first 2 dc's and in the first ch 2 sp. Ch 3, 2 dc in ch 2 sp, ch 2, work 3 dc in same sp. Ch 1, work 3 dc in next ch 1 sp. Ch 1. Work the following 3 times (Work 3 dc, ch2, 3 dc in next ch 2 sp. Ch 1, work 3 dc in next ch 1 sp. Ch 1.) Join with sl st to top of ch 3. Work the next rounds exactly the same but work the following into each ch1 sp on each side of square. (Ch 1, 3 dc, ch 1). 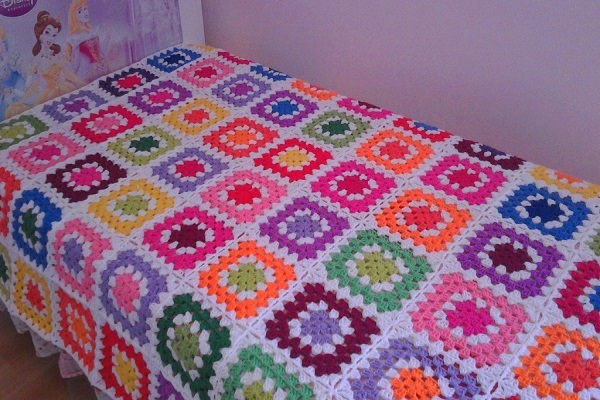 You can make your granny square as big as you want by adding RNDs. Or you can stop at 6 RNDs to make an afgan out of individual squares. You can also use a different color yarn for each RND of a square for a dazzling effect. Changing Colors To change colors at beginning of each rnd Fasten off after slst to top of ch3. Leave yarn about 5" long and after square is complete, weave ends into work. Tie on new color in ch 2 lp and proceed onto the next rnd in pattern. For Finishing each square, After sl st into the top of ch 3, fasten off and either weave both ends into work or weave just the starting end into the work and leave the finishing end long to sew the squares together. I hope you have enjoyed the pattern and I have already left the step by step for you, enjoy and do beautiful work. Enjoy our page on facebook Xell Crafts. Good work, everyone.